This article is about clutch pressure plate overhaul for the later type with the friction discs on the centre clutch plate. The job of the pressure plate is to engage and disengage the drive from the engine to the gearbox. This is done by the pressure plate applying pressure to the clutch plate, effectively sandwiching the clutch plate between the pressure plate and the flywheel. So when you push on the clutch peddle you release the pressure applied to the plate and the clutch plate is able to spin, the engine drive is disconnected from the gearbox and you are able to change gear. As you would suspect the clutch can, and does, see a lot of use during its life and certain parts wear. Luckily we can now obtain replacements parts which make the whole overhaul job much easier and the clutch more likely to work better than before! 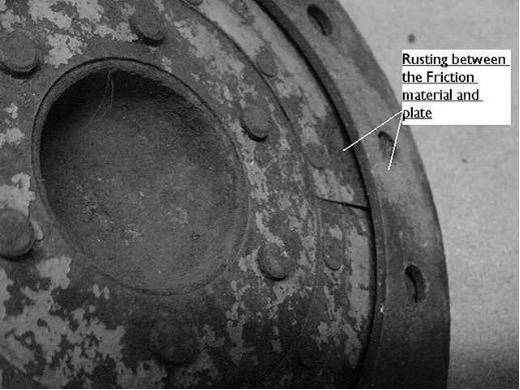 This photograph shows the condition of the pressure plate and the levers. The levers were actually rusted in and required a bit of brute force to remove, (hopefully yours are not like these). Tools required: 3 x 3-4" 'G' clamps , small pin punch (3/16" diameter), small screw driver and a pair of pliers. Parts required: Set of new clutch springs (strongly recommended), 3 x clutch levers, 3 x mouse-trap springs and 3 x fulcrum pins. 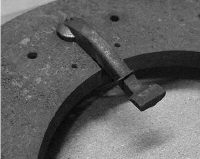 Fit three 'G' clamps evenly around the plate, so that the clamps compress the two plates, between these two plates are held the 12 pressure springs. Screw the three 'G' clamps until the springs are all but fully compressed, sufficient to allow the levers and clutch withdrawal pins to be pushed back into the holes, and expose the two half collars, these collars lock the clutch withdrawal pins in place on the thrust plate. This is difficult to explain on paper but I am sure your get the hang of it when doing this. Now remove the three fulcrum pin assemblies and gently releasing the 'G' clamps again evenly. The levers can now be separated from the withdrawal pin by gently taping out the fulcrum pin. Finally the mouse trap springs can be removed or as in my case they simply fell apart! All the parts of the assembly can now cleaned and inspected. The main items that wear are on the faces of the three levers; these faces make contact with the thrust race. This wear is very easy to see, however, the pivot point on the levers and the corresponding base of the slot in the clutch cover plate are also prone to wear and will effect the performance of the release of the clutch. Option 2 A hole is drilled on the worn part. The hole is then threaded and a small screw inserted and locked in position. 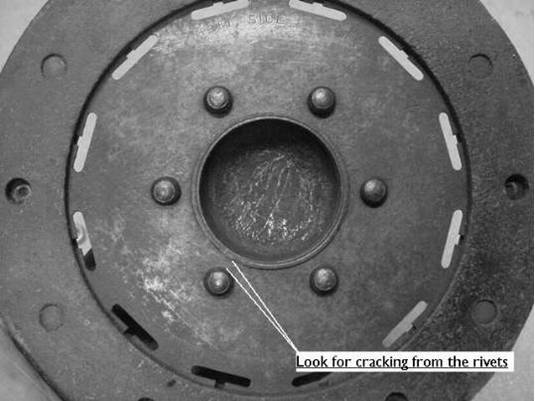 The excess screw is then removed, there is some information on this in the ‘750 Motor Club Companion’ book. As to the levers these can be again welded and ground / filed back to shape. However, I would now recommend that it is better to replace these for new ones as the material may be effected by the welding. 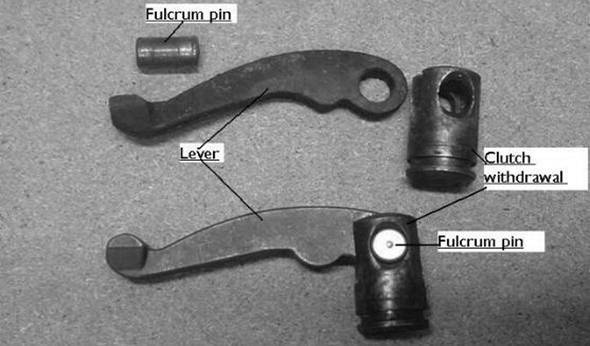 The fulcrum pin which locates the clutch withdrawal pin to the lever will be worn and is a very cheap replacement so again replace this part, and the same applies to the clutch springs as without complex measuring equipment, you cannot easily check the spring rate, so I would replace them. One final inspection note is the clutch withdrawal post, these can wear on the side or the location hole in the pressure plate may be worn. If so these will need to be replaced with a new or good second-hand post. The surface of the pressure plate needs to be a smooth as possible, but I would be careful about having this face machined as It could effect the performance of the pressure plate assembly [and allow the clutch to slip!]. There are two types of clutch plate; Newton Bennett or Borg and Beck, both types are similar and are interchangeable. If the friction material is worn down to the rivets, then the two friction pads will need to be replace. The Seven workshop or Seven services both can sort this out much easier than attempting this at home, and they have the special tooling to finish off the rivet heads, which I would recommend doing. However, before sending these off a very careful inspection is required to look out for rusting around the friction plate as this could lead to a later failure. Also I have seem cracking between the rivets to the gearbox splines (see photo), again I would not recommend that these are used. Photo's of Newton Bennett and a Borg and Beck clutch plate. Finally inspect the splines for wear use the mating splines in the gearbox as a check [one tooth should be missing]. All assembly work should be done using a small amount of suitable high melting point grease, use carefully as you do not want this to get between the friction material and the pressure plate [possibly causing the clutch to slip]. Fit the three mouse trap springs into the cover plate then load all the 12 clutch springs. Sandwich these together making sure the holes for the three clutch withdrawal pins are in line, clamp these using again three G clamps to compress the springs assembly. I found it easier to thread the clutch withdrawal pin assembly through the mouse trap spring, then fit in the corresponding holes. Next job is to fit the two small half collars, which, when the G clamps are released, the half rings will trap the assembly. Loosen evenly the three G clamps and the whole assembly should now be together. To check the assembly is working depress each lever in turn and ensure that the movement is free and that the three levers return to the same condition. This article, written by Mike Davies, originally appeared in CA7C Seven Focus in Dec 2004 pp6-10.